A Silicon Valley company has introduced what may prove the next generation in night watchmen a 5 foot tall, 300 pound crime fighting robot designed to stand sentry in the wee hours of the night. But while Li hailed the robot as a breakthrough to be widely deployed in “schools, shopping centers, hotels, auto dealerships, stadiums, casinos, law enforcement agencies, seaports, and airports,” throughout the country, some are more uncertain over the tangential effects of turning over the reins to a robot. “This is like R2-D2’s evil twin,” Marc Rotenberg, director of the Electronic Privacy and Information Center, a privacy rights consortium located in Washington, D.C., explained to The Times. 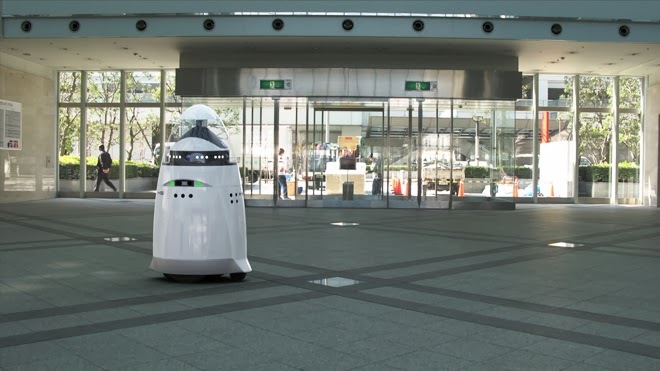 Knightscope says the K5 “utilizes a combination of autonomous robots and predictive analytics to provide a commanding but friendly physical presence while gathering important real-time on-site data with numerous sensors. A Youtube video of the K5 in action shows something that looks like a remote-control vacuum cleaner sizing up the license plate numbers of vehicles parked in an unidentified parking lot. The Times writes the robot whose sticker price has not been revealed will employ a video camera, thermal imaging sensors, a laser range finder, radar, air quality sensors, as well as a microphone. Knightscope adds the robot will also utilize GPS, a night-vision camera, and biological, chemical and radiation detection systems.